Kenan Professor of Government HARVEY C. MANSFIELD ’53 at the Institute of Politics in 1983. Mansfield has spent most of his life at Harvard. Harvey C. Mansfield ’53 came of age at Harvard as part of the “silent generation,” born between the two world wars, childhoods marked by the Great Depression. They entered Harvard in the wake of World War II, as the domestic calm and economic flourishing that would define 1950s culture began to take hold. 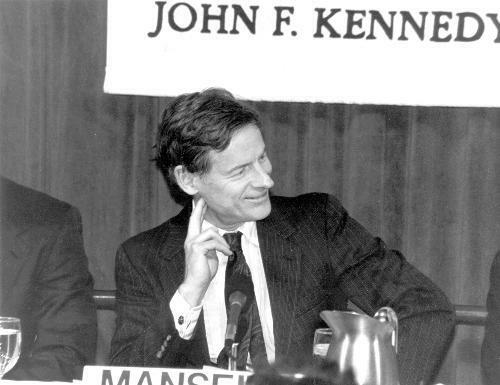 Mansfield says he was no exception to the complacency that typified the era—he spent his undergraduate years diligently studying and remained at the edges of any political debate. At 18, Mansfield had not yet found the political ideology that would fuel both his academic career and personal credo for the next 50 years. Since his undergraduate days, Mansfield has latched onto a conservative platform that has catapulted him into the spotlight as both a professor and an administrator at Harvard. The now-infamous political philosopher has a cause—and is far from silent. In the name of his unfaltering conservatism, Mansfield has attacked grade inflation at the College, scoffed at political correctness and lambasted traditional liberal values, such as affirmative action, gay rights and, most recently, perceptions of gender. The once-quiet Mansfield has provoked protests and sit-ins on campus, inspired countless editorials and articles in the national media and has often agitated his way to the center of heated Faculty meeting arguments. “That’s what I lack when it comes to grading,” he says, chuckling. In 1973, when he began attacking what he perceived as a slow upward creep in student grades, Mansfield first grabbed the spotlight at the College—and he’s never really given it back. Students in the 1970s began calling their professor Harvey “C-minus” Mansfield soon after he first took up issue with grade inflation, and more than 20 years later Mansfield is still on his crusade. Two years ago, Mansfield gave students in his classes two grades, an “inflated” grade that went on students’ transcripts and one that reflected the “real” value of their work. This policy—meant to demonstrate the causes and effects of grade inflation—drew heat from students and faculty, and attracted national media attention. His persistent assault on grade inflation, though, is only emblematic of a firm ideology that has made him the unpopular opposition on most issues confronting the Faculty, from race and sexuality to contemporary politics.